KENNEDY SPACE CENTER, FL--After confirming no problems with the shuttle Atlantis in the wake of overnight thunderstorms, engineers pumped a half-million gallons of supercold rocket fuel into the orbiter's external tank Wednesday to verify the integrity of structural stiffeners intended to prevent cracks during the countdown and climb to space July 8. The initial stages of the three-hour fueling procedure went smoothly but as liquid hydrogen and oxygen circulated through Atlantis' main propulsion system and into the external tank, engineers noticed lower-than-expected temperatures downstream of main engine No. 3's main fuel valve. Such temperature drops can indicate a leak and during a 1995 launch campaign, liftoff of the shuttle Columbia was delayed a week to replace a leaking main fuel valve. Engineers do not yet know whether the temperature readings seen Wednesday indicate an actual leak or some other problem. In any case, there appears to be enough contingency time left in Atlantis' processing schedule to accommodate a replacement without impacting the July 8 target date, officials said, if engineers conclude the 75-pound valve is actually leaking. But engineers will not gain access to the shuttle's engine compartment until Thursday and it's too early to say what, if anything, might need to be done. For the fueling test, the valve was isolated after the low temperatures were noticed, the engine hardware warmed to normal levels and the fueling test continued. Originally scheduled to begin at 7 a.m. EDT (GMT-4), the start of the test was delayed to 12:15 p.m. because of work to check out the shuttle's electrical systems after three nearby lightning strikes and troubleshooting to determine the impact of a lost launch pad power circuit. The tank was topped off shortly after 3 p.m. and two hours later, engineers began draining operations. The test was ordered to make sure vertical rib-like "stringers" in Atlantis' external tank are able to endure exposure to ultra-low temperatures before launch and during the climb to space without developing cracks like those blamed for delaying the shuttle Discovery's final launching late last year. The lightweight aluminum-lithium alloy used to make the stringer's in Discovery's tank came from the same batch used in Atlantis' tank. It took engineers months to figure out what the problem was with Discovery's tank and to come up with a fix that eventually cleared the way for launch last Feb. 24. For Atlantis' tank, ET-138, NASA managers opted to implement the same repair, installing so-called radius block doublers to the tops of the stringers making up the structural ribs of the intertank compartment that separates the huge tank's liquid oxygen and hydrogen sections. The doublers provide additional strength, resisting the contraction that tends to pull the tops of the stringers away from the bottom of the liquid oxygen tank. Before Discovery's ultimately successful launch, NASA carried out a full-scale tanking test, installing scores of strain gauges to measure the actual stresses acting on the stringers as the components responded to the low-temperature rocket propellants. After the test, Discovery was hauled back to the Vehicle Assembly Building for X-ray inspections around the circumference of the intertank to make sure no new cracks formed and to install radius doublers all the way around the upper end of the intertank. For Atlantis, NASA managers opted to forego the instrumentation. The tank was loaded with a half-million gallons of liquid oxygen and hydrogen rocket fuel and then maintained in "stable replenish" mode for another two hours while the propellants are continuously topped off. At the same time, engineers made sure a 7-inch gaseous hydrogen vent line attached to the side of the tank was leak free. Trouble with internal seals, coupled with alignment issues, caused problems during Discovery's initial launch campaign last November. The vent line worked normally during Discovery's February launch and the shuttle Endeavour's two countdowns on April 29 and May 16. After Atlantis' tank is drained overnight, engineers will load a cargo module into the shuttle's payload bay late Thursday before a protective gantry is rolled back in place Friday to protect the shuttle from the elements. Starting this weekend, the upper sections of the stringers on the side of the tank facing the shuttle will be X-rayed to make sure no cracks developed during the fueling test. The work is expected to take about a week to complete. Atlantis' crew -- commander Christopher Ferguson, pilot Douglas Hurley, Sandra Magnus and flight engineer Rex Walheim -- plans to fly to the Kennedy Space Center Monday for NASA's final "terminal countdown demonstration test," or TCDT. After reviewing emergency procedures at the launch pad, the astronauts will strap in Thursday for a dress-rehearsal countdown to clear the way for launch. Shuttle program managers plan to review Atlantis' launch processing June 21, followed one week later by an executive-level flight readiness review to assess any unresolved problems and set an official launch date. As of this writing, there are at least two "unexplained anomalies" from Endeavour's flight that have yet to be resolved, although neither is expected to result in a launch delay. During Endeavour's climb to space, a camera on the shuttle caught a glimpse of a cylindrical piece of debris falling away around the time the shuttle's twin solid-fuel boosters separated. The debris has not yet been identified. The second issue is what triggered a brief landing gear brake fire that appeared to flare up shortly after touchdown. An inspection found no damage to the brakes or landing gear and engineers do not yet understand what happened. Atlantis' external tank was beefed up in the wake of problems with Discovery's tank that were discovered after a Nov. 5 launch delay due to a hydrogen vent line leak. After the countdown was scrubbed, small cracks were found in two of the stringers used in the wall of the external tank's central intertank section. The cracks were repaired, but work to understand what caused their formation required exhaustive tests and analyses. The analysis had to address two major questions: issues: the structural integrity of the tank and the likelihood of small cracks to cause foam insulation to pop off during ascent. Engineers ultimately concluded the cracks were caused by temperature-induced stress near the tops of the stringers as the upper liquid oxygen tank, exposed to minus 297-degree propellant, contracted during fuel loading. That contraction causes the tops of the stringers to pull inward. The tank is designed to accommodate that contraction, but a manufacturing review found that the aluminum-lithium alloy used in the stringers was from a lot that was more brittle than usual and more susceptible to fractures. To provide additional strength, radius-block doublers were riveted into place over the top few inches of 105 of the 108 stringers used in the intertank section to make them less susceptible to stress-relief fractures. 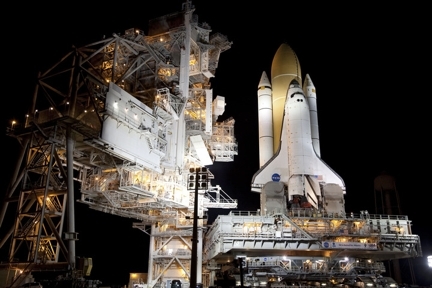 There were no problems during Discovery's eventual launch. The shuttle Endeavour's tank had a different heritage and while radius block doublers were installed as a precaution, engineers decided a tanking test was not necessary.